Due to the fragile nature of the material, we cannot ship ceramic fiber boards by UPS. This item will be shipped only via trucking freight. Please call or email us for a freight rate based on your order quantities. 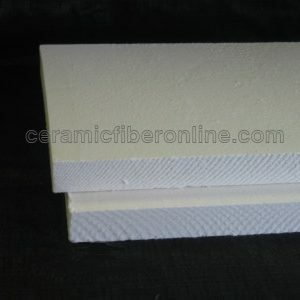 CeramFiberOnline.com offers a family of high temperature ceramic fiber boards, which are produced through wet forming process of ceramic fiber and binders. Ceramic fiber board is featured with high temperature stability, low thermal conductivity, even density, and excellent resistance against thermal shock and chemical attack. 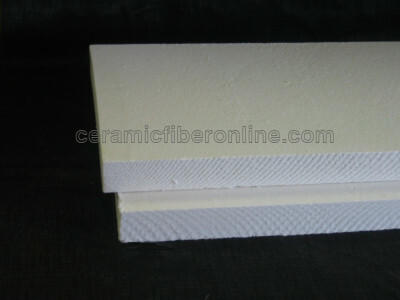 Ceramic fiber board also resists oxidation and reduction. If they are wet by water, steam, or oil, physical and thermal properties are fully restored upon drying. Ceramic fiber board is used for a variety of thermal insulation applications, including refractory linings, backup insulation, baffles and muffles, heat shields, combustion chambers, flue insulation, and fire protection. These ceramic fiber boards are available in a variety of temperature ratings, densities, thicknesses, widths and lengths, and custom vacuum formed shapes.